Seeming desolate and inhospitable, the Arava desert is in reality the site of innovative approaches to agriculture, water resources and scientific research. 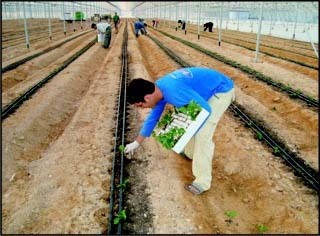 Members of one of the Arava's five "moshavim" (farming villages) plant crops at the start of the new agricultural season. There are more than 600 farmers in the region. 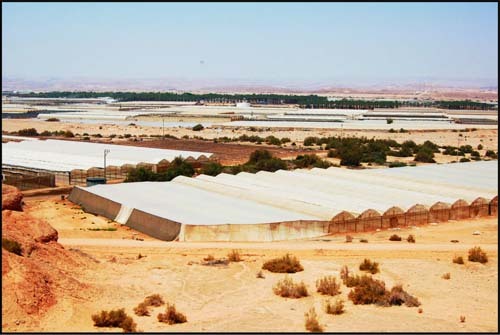 Greenhouses in the desert are fulfilling Ben-Gurion's vision of a flourishing Negev desert and also providing 60 percent of Israel's agricultural exports to Europe. Situated in a remote part of the eastern Negev, the Arava is Israel's most isolated region. Water resources are scarce. Temperatures can soar past 120 degrees. In every direction, the landscape is bleak and desolate. A mission mounted by the British Palestine Exploration Fund in 1865 proclaimed the area "unfit for human habitation." Yet, where others saw an inhospitable, unforgiving environment, Prime Minister David Ben-Gurion saw potential. It was here, Ben-Gurion proclaimed, that "the people and State of Israel will . . . accomplish the great mission of populating the wilderness and bringing it to flourish." A visitor from Development Corporation for Israel, also known as Israel Bonds - an organization known for helping Israel achieve the impossible - discovered that through ingenuity and determination, Arava's resilient residents have realized achievements that would astonish even Ben-Gurion, including accounting for 60 percent of the country's vegetable exports to Europe and 10 percent of its cut flower exports. Noa Zer, who lives on one of five moshavim in the Arava - the first was established in 1959 - is proud to play her part in "fulfilling Ben-Gurion's vision." She says this as someone who, two years ago, left the vibrant scene of cosmopolitan Tel Aviv for a place where an errand as routine as going to the bank - which necessitates driving either to Eilat or Beer Sheba - can take an entire day. While the adjustment has been daunting, Zer embraces the Arava's "strong sense of community and belonging." The challenges of living and working in the Arava are formidable. A harsh, unforgiving environment. Isolation. Limited resources. There are even land mines, planted during years of conflict between Israel and Jordan. When driving winter rains come, flash floods can dislodge the mines, sweeping them along in the torrent, and, says Zer, because the mines are plastic, they cannot be uncovered with metal detectors. This necessitates crawling along the ground feeling for mines immersed in mud so they can be safely extracted. "Most places in the world," asserts Fredy Zach, "don't use water like this." A retired IDF brigadier general who was a member of the elite paratroopers and went on to serve as a military coordinator throughout the territories, Zach is an enthusiastic advocate for the Arava, calling the region "amazing." He takes special pride in the way the Arava is strengthening peace between Israel and Jordan. "I don't recognize borders," he says. Through his consulting company, Zach endeavors to share Israel's water expertise with the Jordanians. He says regional tensions keep the interaction at a level of "quiet cooperation "but "relations, from an agricultural point of view, are very good." 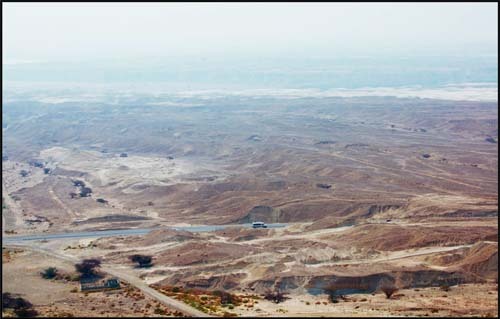 The Arava is also the site of far-reaching R&D. The Dead Sea-Arava Science Center (DSASC) is engaged in myriad scientific projects, including extracting compounds from desert plants to seek clues that could help cure human diseases; biotech; geology; and desertification, which has attracted international delegations eager to learn from Israeli expertise. The DSAC devised a means of cul-tivating fish ponds using brine from desalination. The center's success in breeding tropical fish in the desert won it a sustainability award. The members of the aforementioned Palestine Exploration Fund would undoubtedly be amazed by what is transpiring in this seemingly hostile environment. But this is Israel, and all this, and so much more, is what is emerging from the dramatic transformation of the Arava - a true microcosm of the Israeli spirit.